Bring your own photographer along, or give your camera to your instructor – it’s up to you! I had an amazing experience with my instructor and photographer Ms. Agatha! She was really patient with me and directed the on how to properly pose for the photoshoot, and the photos turned out amazing! They have a collection of beautiful mermaid tails! I wanna try the Mermaid Swimming lessons next time! This is a highly recommended activity for that unique Boracay fantasy experience! 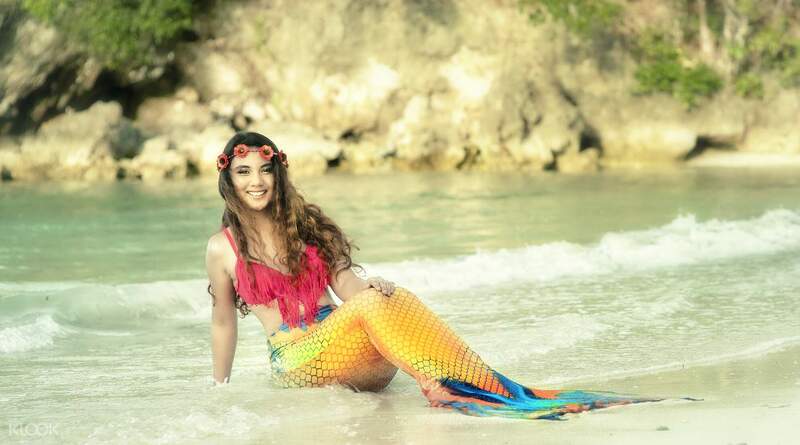 When everyone's beach vacation photos are starting to become a bit similar, make yours stand out by being truly one of a kind: a mermaid photoshoot, directed and led by mermaid swimming instructors! Live out your dream in becoming a gorgeous fantasy creature in the world renowed beach of Boracay in this 30-minute photoshoot. You'll be fitted with mermaid tail that comes in an array of colors and styles. Match it well with your chosen swimwear and you'll be the most beautiful mermaid in the beach! Instructors will carefully lead you in a variety of great mermaid poses to make your photoshoot truly unique. You even have the option to bring your own photographer, or just hand your trusty camera to the instructors so they can do the shots for you. This is a truly unique experience that will definitely let you live out all your mermaid dreams! Come in a colorful swimsuit to make your photo stand out! Swimming in the tail is not permitted due to the safety policy. If you are interested in swimming, you are welcome to join the Mermaid Swimming Introduction Course! I had an amazing experience with my instructor and photographer Ms. Agatha! She was really patient with me and directed the on how to properly pose for the photoshoot, and the photos turned out amazing! They have a collection of beautiful mermaid tails! I wanna try the Mermaid Swimming lessons next time! This is a highly recommended activity for that unique Boracay fantasy experience! I had an amazing experience with my instructor and photographer Ms. Agatha! She was really patient with me and directed the on how to properly pose for the photoshoot, and the photos turned out amazing! They have a collection of beautiful mermaid tails! I wanna try the Mermaid Swimming lessons next time! This is a highly recommended activity for that unique Boracay fantasy experience! A surreal experience. Worth every penny, it is on a very busy beach and everyone was staring, but it was hysterical. We didn't stop laughing from start to finish. A surreal experience. Worth every penny, it is on a very busy beach and everyone was staring, but it was hysterical. We didn't stop laughing from start to finish. The staff was very friendly. Price is a bit pricy but hey, it's all worth it. The staff was very friendly. Price is a bit pricy but hey, it's all worth it. We had a fun experience on our last day in Boracay and the Mermaid Photoshoot was our last acitvity. I thought there will be a pick up on our hotel so while waiting we are late for the schedule because as we thought like same activities we will be fetched in the hotel but we should proceed on their office. Even we are late they accomodated us. They are all nice and approachabke and very accommodating. The director of the shoot was so frendly and kind. It was a great fun experience. Can’t wait to upload the photos. Will recommend this to people to try it. We had a fun experience on our last day in Boracay and the Mermaid Photoshoot was our last acitvity. I thought there will be a pick up on our hotel so while waiting we are late for the schedule because as we thought like same activities we will be fetched in the hotel but we should proceed on their office. Even we are late they accomodated us. They are all nice and approachabke and very accommodating. The director of the shoot was so frendly and kind. It was a great fun experience. Can’t wait to upload the photos. Will recommend this to people to try it. Not too bad for a sunset mermaid photo experience. Awesome coordinator who helped to take photos at no charge. Be prepared for the cold for those who did not intend to touch the waters. Not too bad for a sunset mermaid photo experience. Awesome coordinator who helped to take photos at no charge. Be prepared for the cold for those who did not intend to touch the waters. The coordinator is very accommodating. She knows her job well and the experience is awesome! The coordinator is very accommodating. She knows her job well and the experience is awesome! Add to your itinerary for experience and IG feeds. Don’t forget to bring your accessories. Add to your itinerary for experience and IG feeds. Don’t forget to bring your accessories.